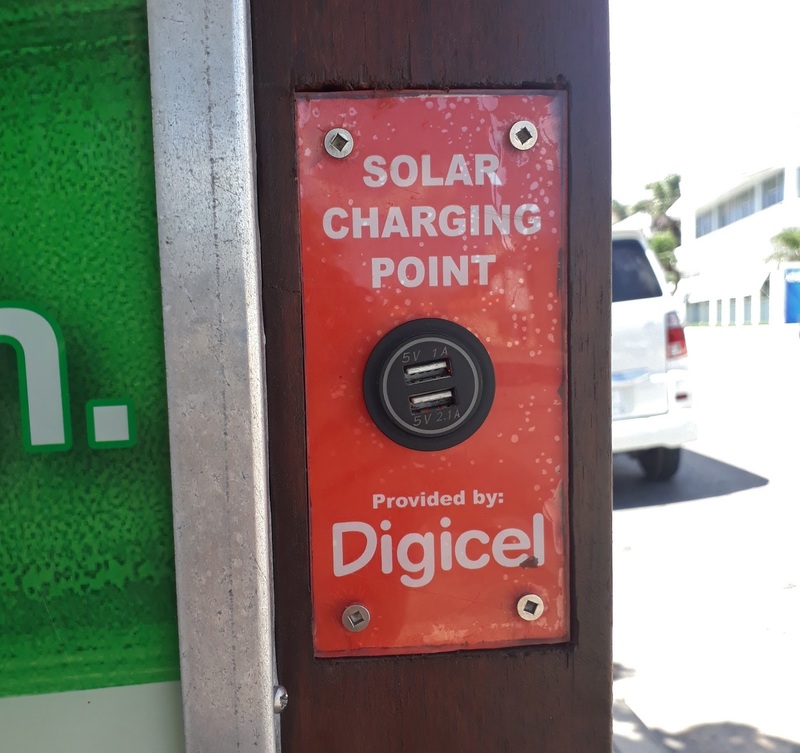 Makes sense for the cell company to give you a place to charge your phone! 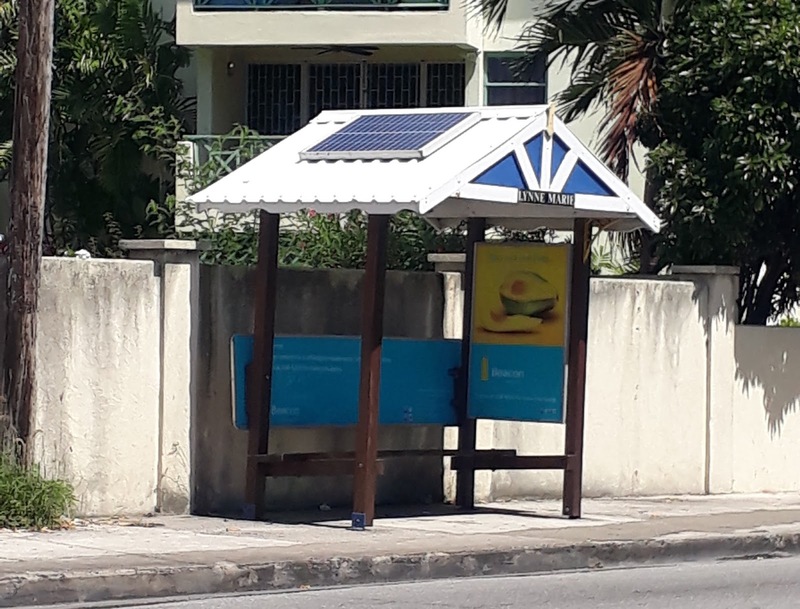 Typical bus stop in Barbados. We didn't have to wait long and we found a bus destined for Speightstown, which is further north than Holetown. Paid $2.00 BBD ($1.35 CAD, $1.00 USD) for the 18 km (11 mile) bus ride. Not everything in Barbados is expensive. Just most things. There's not really that much to see in Holetown. The main drag has some high end type of stores. Ralph Lauren... that kind of thing. But one good reason to come to Holetown is that because it was the site of the first settlement, it was also the site of the first church. St. James Parish Church was originally built in 1629, but a hurricane destroyed the original wooden structure in 1675 and it was replaced with a stone church. And an even more interesting organ. Some of the gravestones have barely legible dates from the 1600's! Wandering around, we came to the Folkstone Marine Reserve, whatever that is. The wanted $5.00 BBD to visit their small museum, so we passed on that. Otherwise, there is a nice park on the waterfront that has picnic tables in the shade and a large blocked off area of the water that is for swimming or marine research. They rent out snorkeling equipment as well. Might be a nice spot to come back to another day. Didn't see any tourists there, but it seemed popular with the locals. The beach at Folkstone Marine Reserve. There's a short beachfront path that leads to some resort properties. And a huge beachfront mansion! Ruth wants to know who lives here! Ruth did some research this morning and it turns out that property belongs to British billionaire Anthony Bamford. We saw this storm coming in slowly. We stopped at a beachfront restaurant that had umbrellas and figured we would be safe there. We had a drink, but weren't enthusiastic about the menu. The rain looked like it was going to hold off, and I had read about the nearby Cafe Moya which had great reviews and also some gluten free options so we walked over there and two minutes after we sat down the skies opened up and it poured with rain for about 45 minutes! Really nice little spot, and with (considering it's Barbados) reasonable prices. Ruth had the salmon stuffed crepe and I had the cajun chicken stuffed crepe. The crepes were made with casava flour. 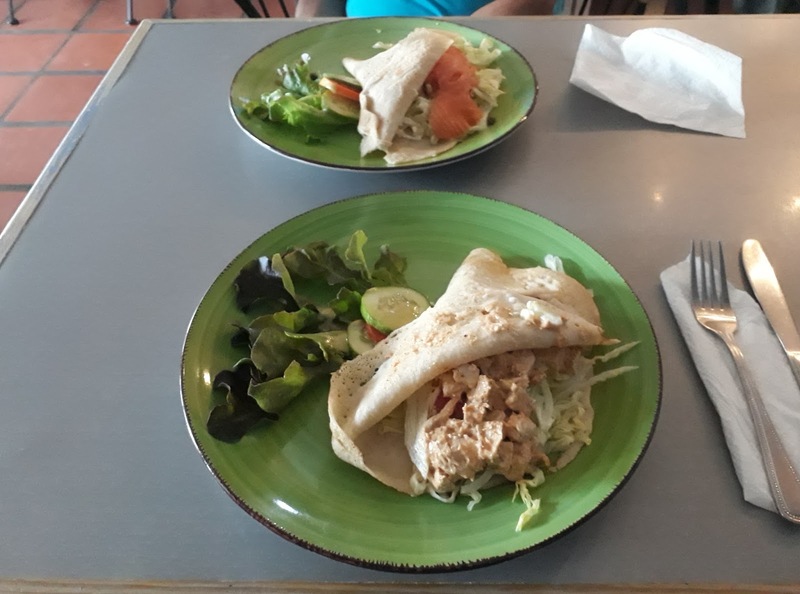 The crepes were really yummy, with a nice soft pliable texture. Total bill for the two of us, $55 BBD ($37 CAD, $27.50 USD) including tax and tip. We were looking for a grocery store to pick up a couple of things before we got on the bus. The rain had stopped and the owner of the cafe told us that there was a grocery store about a mile and a half down the road. We decided to walk. Then we got on a bus, but by now it was rush hour and the bus was standing room only and very crowded. Standing, my head hit the ceiling. Not comfortable at all. And the bus was hardly moving. We ended up getting off early and walking for a while. Coffee, Tea, and Hot Chocolate! We visited Barbados back in the 1980s and one of the most memorable places remains the St. James Parish Church and graveyard. Great pics and thanks for posting! Yes, it is a beautiful church, inside and out. Those gravestones are so old that some of them you can't even read the writing that used to be on them. Loved the church and beaches...have to look up that poison tree...yikes. That is a pretty scary sounding tree. I hope that we will recognized it if we were to see one again that isn't labelled/marked. Looks like you both are having a great time! Rain may cool things down a bit and you both are keeping fit with all that walking! Nope, the rain doesn't cool things down, except for cooling as you get wet. The temperature is a pretty constant 29C, 84F every day. We are definitely getting ourselves back into shape! Looks like a cool place to visit! The picture titled "A storm is brewing" is beautiful. Great picture! You guys have a nice eye for beauty.